I went to the Natural History Museum last week and came across this. 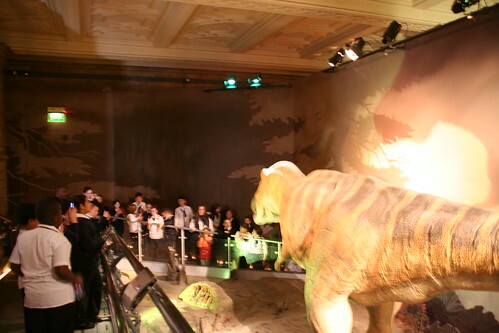 An animatronic T.Rex being filmed by a whole load of schoolchildren – like multiple mini versions of Scoble, all with their phone out, video and taking pictures. I saw very few actual cameras, they all had the phone. How many of these actually do something witht he footage, the images? Do they take it off the phone or just keep it on there to share? For the museum, it does raise a question as their visitor guidelines ban the use of cell phones. I’m pretty sure they mean for taking calls, as there’s no restrictions on cameras. They need to update the rules. This entry was posted in fun, technology by Rachel. Bookmark the permalink.